High stock removal performance grinding disc with ceramic grit. 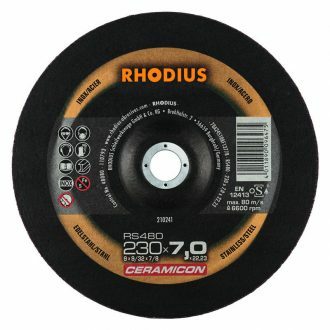 The Rhodius 230mm Grinding Disc RS480 CERAMICON provides high stock removal performance with a ceramic abrasive grit. Ideal for use on high-frequency grinders and air grinders. The Rhodius 230mm Grinding Disc RS480 CERAMICON is constructed with three full-face fabric layers for extra safety and increases longevity of the disc. It is suitable for use on steel, stainless steel and cast iron materials. The Rhodius 230mm Grinding Disc RS480 CERAMICON is part of the CERAMICON series. Grinding Discs in this range offer high-performance ceramic grain tools. Ideal for industrial grinding applications.